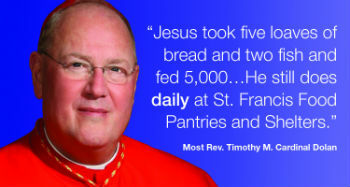 Fall was full of fantastic programs and food distribution at St. Francis Food Pantries and Shelters. Our first "A Taste of Greece" Luncheon was held at the Affinia Manhattan Hotel for over 500 clients from the Food Pantry we help support in Midtown. Ernie Anastos and his wife Kelly were among the volunteers serving the meal and visiting with the guests. Ernie also had a film crew with him taking video and interviews for his new television show "Positively Ernie" which airs on Fox 5. Immediately following Super Storm Sandy, many corporations and individuals contacted us to conduct various Drives to help our clients affected by the storm. CIT held a Diaper Drive, Warren Prep Academy students organized a Canned Food Drive, and Amtrak's Clothing Drive, part or their "Hurricane Sandy Relief Efforts" all provided much needed help to thousands of our clients. Hundreds of coats and clothing were donated again for our clients by Ross Stores, coordinated by Abigail Garcia, Operations Supervisor. The generosity of our many donors to our "Stocking the Shelves" program allowed us to deliver thousands of cases of food to Food Pantries, Soup Kitchens and Shelters in our network. Peanut Butter & Jelly Sandwich Days were held by Macy's and also by Jones Lang LaSalle. Their employees and executive leaders made more than 12,000 sandwiches on three separate days which were distributed to many of our Food Pantries and Soup Kitchens. We sent over 120 students from St. Vincent Ferrer High School to see a production of "The Little Flower" - a play about the life of Mayor Fiorello H. La Guardia. This was our good friend and supporter Tony Lo Bianco's one-man play that relived La Guardia's last day of his 3 term administration as NYC's Mayor. 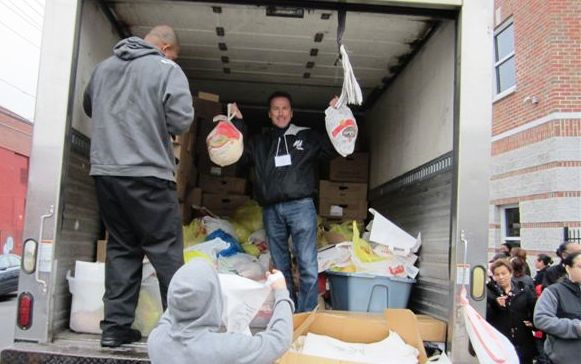 This year St. Francis Food Pantries and Shelters were able to distribute over 7,000 turkeys thanks to the generosity of our corporate sponsors Macy's, Time Warner, Con Edison and Emigrant Bank. This allowed many of the families we help enjoy a great Thanksgiving meal. Con Edison sent us hundreds of Emergency Cots immediately after Hurricane Sandy which were distributed to neighborhoods we serve that suffered much devastation. Congregation Rodeph Sholom selected St. Francis Food Pantries and Shelters to receive over 100 complete Bag Lunches made by their members for their Annual Mitzvah Day of Giving. These were delivered to a Men's Shelter in our network. Our Annual Winter Coat Drive Kickoff started with a great response with boxes positioned in lobbies of The Durst Organization buildings, Kaufman Management buildings, and Perkins and Will. All of these great efforts helped so many clients served by St. Francis Food Pantries and Shelters. Again we salute the individuals, volunteers and corporate sponsors who allow us to further our mission.